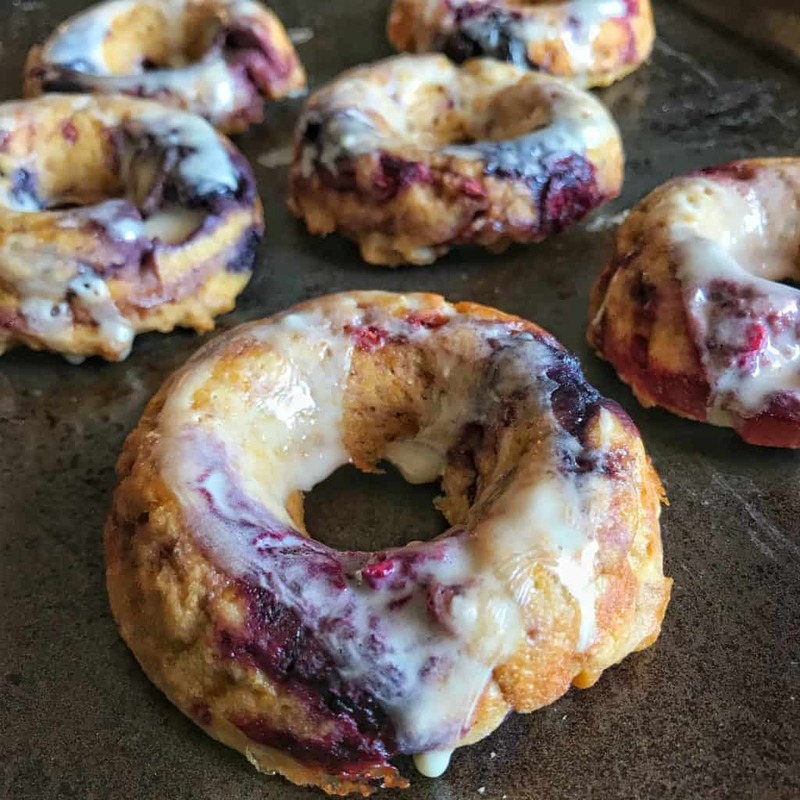 With six ingredients, seven grams of carbs, and twenty-two grams of protein each, I’ll go out on a limb to say this blueberry cake donuts recipe is one of best low carb donuts recipes you’ll find. And if you think that’s hyperbole, you should know I donut play. 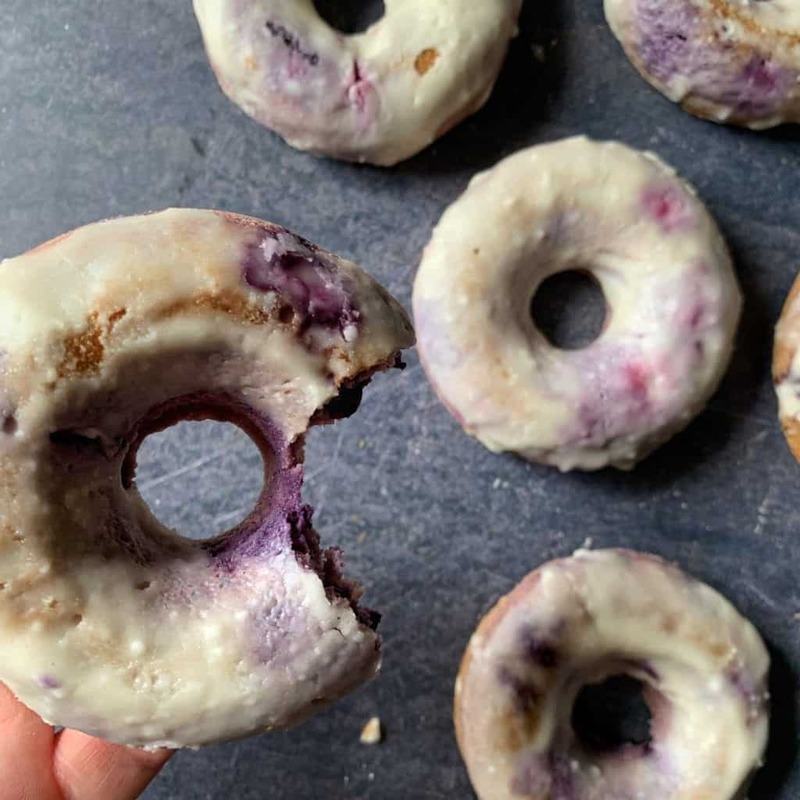 There are juicy blueberries in every single bite of the moist cake donut and a sugar free glaze that makes everything just melt in your mouth. Okay, let’s get into the ingredient and recipe notes. As always, the recipe is simple and the ingredients are nearly all customizable. I’ve quickly fallen in love with almond flour in baking since I discovered it can be swapped (most of the time) 1:1 with my other flour-love, all purpose flour. If you don’t have almond flour on hand and want to use all purpose, 3/4 C or 90 grams of all purpose flour should work great. If you need another gluten free, low carb option, you could always try coconut flour. That said, coconut flour does not swap 1:1 like almond and all purpose since it’s so absorbent. If there’s any way to go half and half like I did in my hot chocolate protein donuts, that would be ideal. The recipe calls for a new flavor of Bowmar Nutrition Protein Powder—Blueberry Cheesecake. But don’t worry, the recipe works with other flavors. I love using their Frosted Cookie protein powder (similar to a vanilla protein powder) in recipes, and that would work great here. This protein powder is whey-based and weighs 28 grams per scoop. Both of these are important facts if you plan on using another protein powder. With 4 scoops of protein powder in the recipe, be sure to take note of your scoop size to avoid using 150 grams of protein powder as opposed to 112 grams. And if you’re using a plant based protein powder, you may need to add a bit more liquid since many of these tend to absorb more moisture and dry baked goods out. 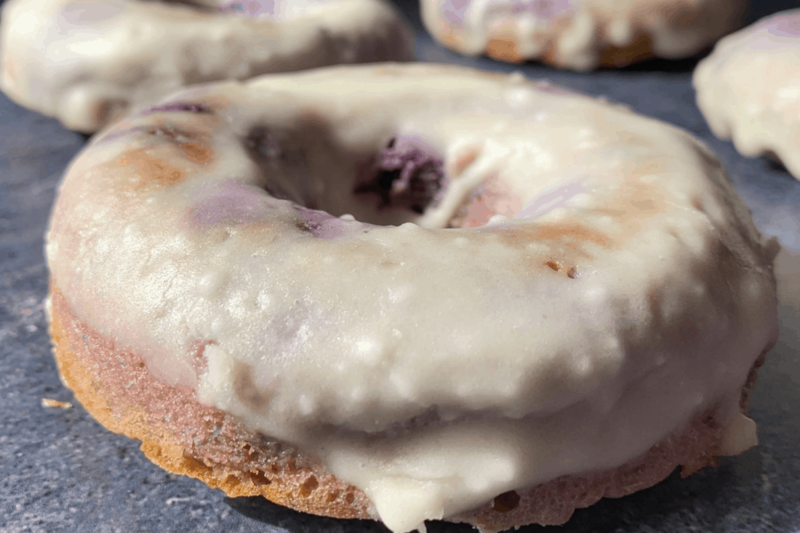 Aside from a bit of runoff from the blueberries, the liquid ingredients for these blueberry cake donuts comes exclusively from Greek yogurt and eggs. Fat free Greek yogurt is a great way to remove higher calorie ingredients like oil and butter as well as add a bit more protein to recipes. 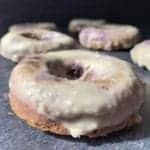 If you need to remove the dairy from this donut recipe, you could always add the oil or butter back in. I’d suggest about 1 C of oil or butter in place of the 3/4 C yogurt. Additionally, you could try using plant based yogurt alternatives instead of the Greek yogurt. 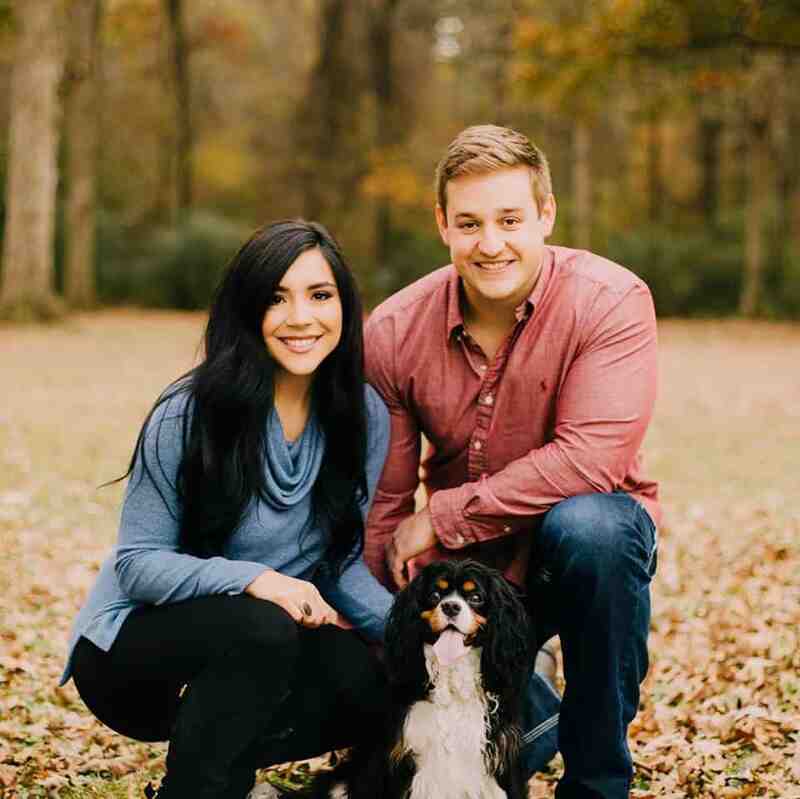 I don’t have the personal experience in this area to make recommendations, but I’d love to hear about your findings! The recipe calls for Swerve Confectioners which is a zero-calorie, non-glycemic powdered sugar substitute. 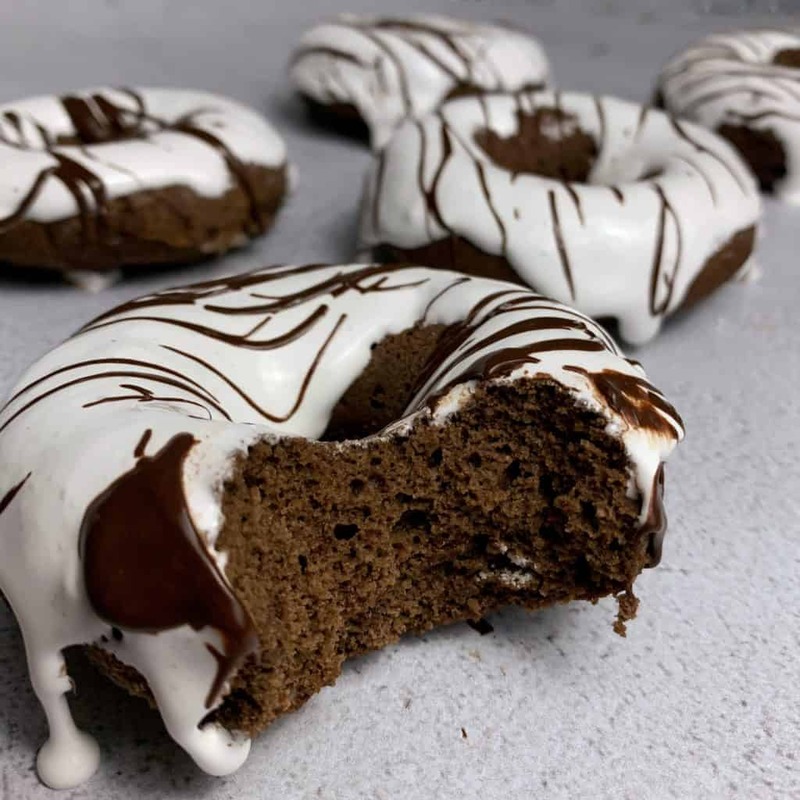 If you don’t have any on hand (get some), you could use another powdered erythritol product, real powdered sugar, or try the following glaze I used in my Cap’n Crunch Berries Protein Donuts recipe. Blend the dry ingredients for 30-60 seconds. Simply mix with your choice of milk and stir. Pour or spoon the glaze on top of the donuts and give them 1-2 minutes to set. The recipe calls for fresh blueberries, but I used both fresh and frozen in testing. You can microwave frozen blueberries for about a minute before adding to the batter to remove some of the excess liquid from freezing. You’ll have a bit of bleed into your batter, making it blue, but that won’t affect anything other than aesthetics. All right, donut delay any longer. Get to cookin’. 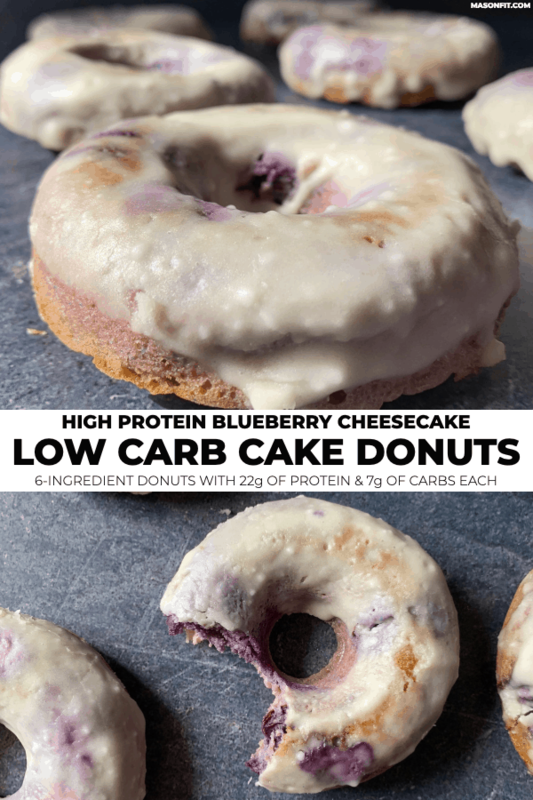 If you make these low carb blueberry cake donuts or any variation, I’d love to see ’em! Snap a pic and tag me on Instagram @mason_woodruff. Or you can join my free Facebook group and share it with the Proton Party. An unbelievably moist 7-carb cake donut made with almond flour and protein powder and topped with a sugar free glaze. Preheat and oven to 350F and place a silicone donut mold on a baking sheet or spray a 6-donut tin with nonstick cooking spray. Transfer the batter to the donut mold, filling each nearly all the way full. Bake for 22-25 minutes or until the donuts are cooked through. 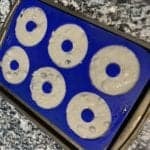 Remove the mold from the oven and allow the donuts to briefly cool before removing and transferring to a wire rack to cool. For the glaze, mix the confectioners sugar and water in a shallow bowl and dip the cooled donuts face down. If you'd like less glaze or a drizzle, use the lower end of the measurements and spoon it on top by hand. Macros do not include the glaze since you may want to tweak the amount used. If you follow a net carbs regimen, you can ignore the macros from the glaze as Swerve is a zero-calorie, non-glycemic sweetener. If you track everything, I'd log the carbs listed on the label. 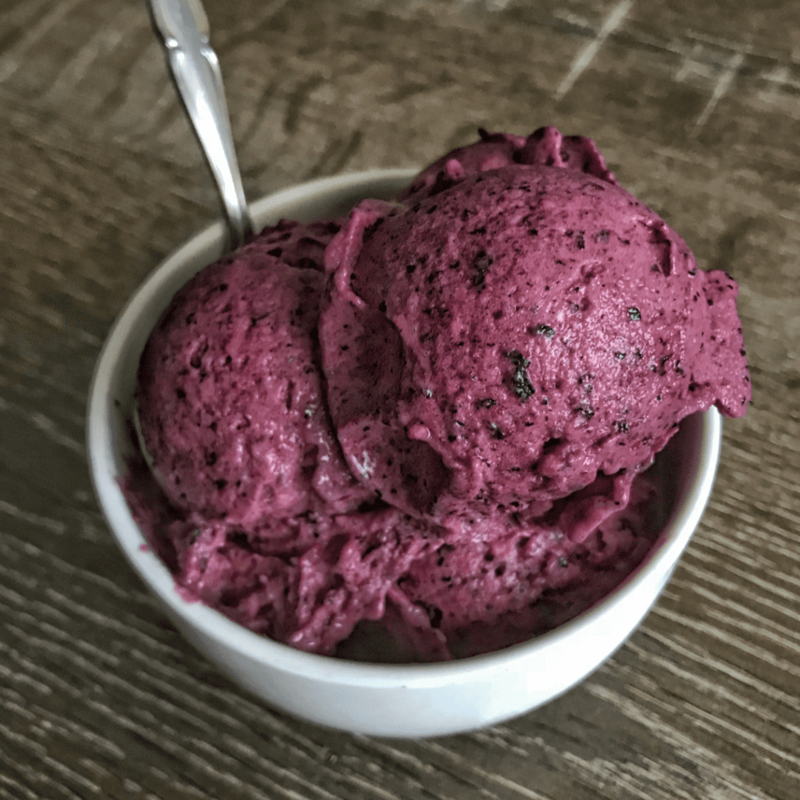 I’m biased, but I feel my blueberry mango protein ice cream is certainly worth screaming for. 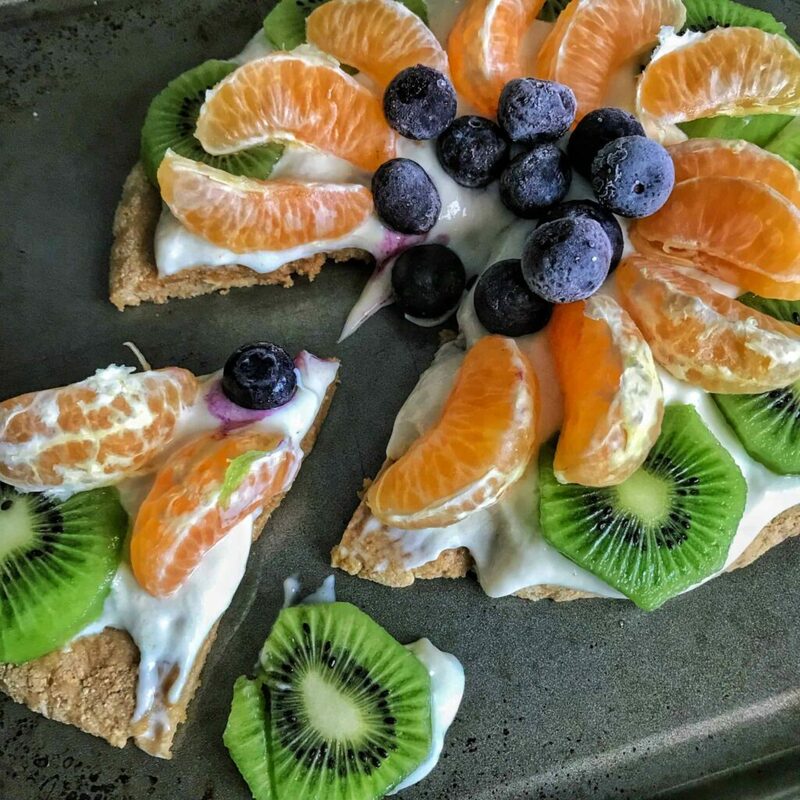 And if you’re interested in a fruit shmorgishborg, you’ll want to check out my high protein fruit pizza. Can’t WAIT to try this! Husband & I both T2 Diabetics on insulin, it will be so amazing to have this once in awhile. I’ll definitely send pic. Thanks in advance for trying out the recipe. I hope you guys enjoy them as much as I did! Would love to have these recipes emailed to me please. Can’t wait to try these recipes! Don’t have donut forms. Ca. I make biscuits or muffins? Someone actually made muffins with the batter last night. They might take a bit longer to bake depending on how many muffins you make. Love this recipe, goiy to make muffins. I made your pumpkin spiced donuts which turned out great. These not so much. Not sure why the flour and protein grams are so high compared to the pumpkin ones. These turned on very very dense and tough. Very odd that the pumpkin donuts call for 30 grams of both flour and protein powder but these call for basically triple of both with the same liquid amounts. One of the few fails I’ve had from your site. I hate to hear that. These are much larger than the pumpkin donuts, hence the amount of flour and protein powder. Did you make any ingredient substitutions? Nope. Followed the recipe line by line with exact measurements. Like I mentioned the pumpkin ones were great and I believe that the protein powder and flour amounts for the blueberry recipe are just too high. I’ll chalk it up as a loss and adjust the next time I make these. Won’t stop me from following though! You have great ideas and enjoy your work! If I could throw out one more suggestion, maybe try again and bake a few minutes less. Over baking can turn a protein donut to a rock in no time. I’m not doubting you, I just tested different recipe variations and found this version seriously melted in the mouth. Either way, I appreciate the feedback! I added cinnamon, vanilla used the blueberry juice in my frosting, and I [email protected] for 19 minutes. The rest I followed. Mine turned out amazing. Thanks! Just made these- as in they are still warm from my oven. Amazing!! I didn’t have a donut mold so I used a mini bundt cake pan mold. I also only had a bag of frozen mixed berries. I thawed them in the microwave and saved the juice. The recipe made 12 mini bundt cakes. For frosting/glaze- I used 2 T fat free cream cheese softened, a few tsp of the berry juice and 1 scoop of Bowmar birthday cake protein powder. It was awesome. 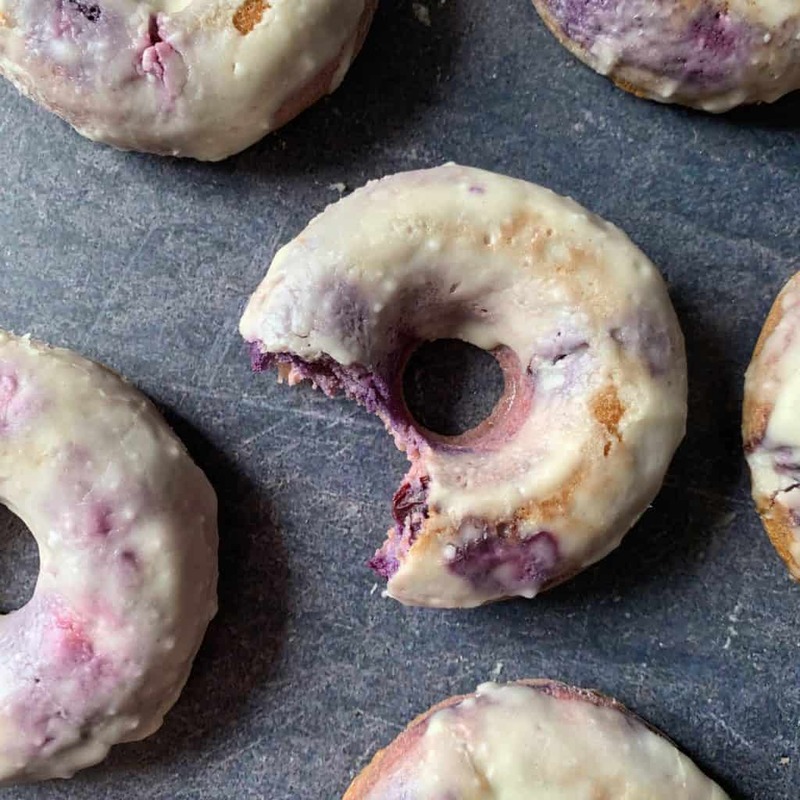 You can definitely make the glaze thicker or thinner by the amount of berry juice used. Can’t wait to keep playing around with flavors on this!! Thanks Mason!! I liked these- the blueberry flavor was amazing. I don’t eat low carb so I’ll probably just use all purpose flour next time. I also think they are perfectly delicious with or without the glaze. OmG! 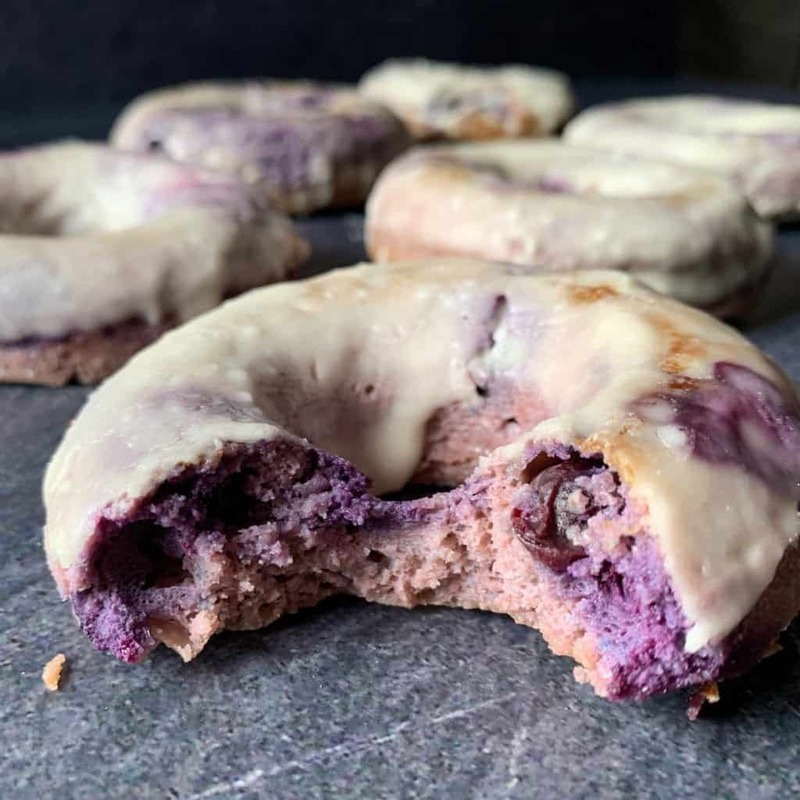 For real the best blueberry protein donuts! I love all your recipes! But my husband was especially impressed with these donuts! I’m currently making the blueberry for him and the hot chocolate donuts for me! These are DELISH. I got a yogurt that had diff grams of serving size for yogurt so it made more batter than 6 donuts but I’m not complaining!. Used frozen blueberries but so good! will try next time with the icing he used but I kept it simple and used fluff low sugar funfetti frosting. Because, well, sprinkles… yum! will be remaking regularly. I made these today and they were incredible! I used PFC instead of PBCC and added a little lemon zest and lemon juice and they were GREAT! So happy I found your page. I made two batches. The first was dry. I then baked four minutes less and they are still dry. I wish u could recommend these but they look a lot better than they taste. Did you use different protein powder or change any ingredients? I’m not going to lie, I didn’t have high hopes for these, I was expecting a rubbery, flavorless donut…WRONG! These were absolutely delicious, so simple to make and they weren’t the least bit dry or lacking flavor. My husband absolutely loved these as well! I can’t wait to try your other donut recipes. Thank you for making donuts for the health conscious. These turned out great! They smelled so good baking in the oven and taste even better. I don’t have a donut pan so I made 12 muffins…it took about 25 minutes to bake. I also didn’t have powdered sugar so I left them plain. I may drizzle a few with some melted white chocolate chips. As I was making the first batch I read the one comment that said they were a bit dry so I tried to tweak it a bit. I used 1.5 cups of almond flour, 6 scoops of Dr. Axe collagen protein (it’s what I had), 1/2 tsp of baking powder, 1/2 cups plain 5% Greek yogurt, 4 eggs, 1.5 cups of blueberries, and 1/2 tsp vanilla extract. They turned out way too eggy, but I think I stumbled upon a viable quiche if you replace the vanilla and blueberries with meat and veggies. Second batch, following the directions to the letter, is in now. Hopefully they turn out correctly.